How Do I Use EndNote and EndNote Web? Information and tips to getting the most out of EndNote and EndNote Web at Penn State Hershey George T. Harrell Health Sciences Library. EndNote helps you keep track of your citations and format them properly as you write your manuscript. Several labeled workstations in the small computer lab/study area, near C2610, second floor Library, have X4. Three (3) workstations in the first floor Library. Inquire at the main desk. Be sure to save your EndNote Library on your flash drive or on your personal M drive. EndNote Desktop can be purchased from the Penn State Computer Store. You can also use EndNote Web which is FREE and recommended. Now it's time to build your EndNote library with all of the references that you want to use when writing. Three ways of doing that are described below. This recommended method allows you to use all of the powerful search features of the PubMed interface. Select the citations you wish to import. Click "Send to" in the upper right, select "File" and change the format to "MEDLINE". Click "Create File." Choose the PubMed file that you saved. Select PubMed(NLM) as the import option. This method is the best method to use if you already have a list of citations to add to your library, or if you have PubMed ID numbers for the articles. If you have not yet collected any references, doing a topical search within a specific database (i.e. PubMed, Web of Knowledge) is a better way of searching the literature. 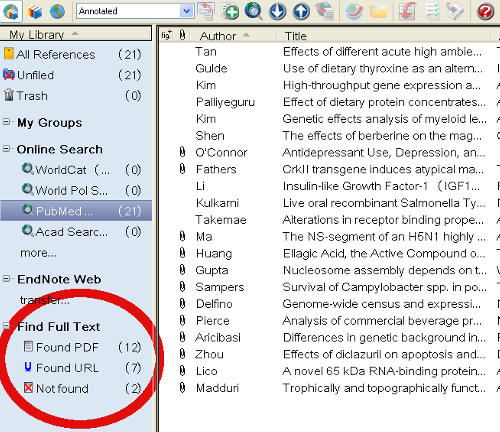 Databases such as PubMed offer search functionality that is superior to EndNote's "online search" function. The "Choose a connection" box will open. Choose the database to search, then enter your search terms. You will receive a message with the number of results found. You can choose whether to load all or some of the references (as long as you have the "online search mode" icon clicked in the upper left) . They will be downloaded into your Endnote library. The most basic way to enter a reference is by typing it in, but this method is discouraged since it increases likelihood of errors. Click References menu / New. Select the document type, such as "journal article." Save the reference by closing the record and returning to the reference list. EndNote X3 - X5 offer the option to find the full-text of the references downloaded to your EndNote library. Select the references for which you want to find full text. Right click and select: Find Full Text – Authenticate. You will be taken to the PSU "thumbprint" page where you will be prompted for your Penn State Access ID and password. Click “login.” Click “done” to close the window. Back at your EndNote library, right click the selected references AGAIN, and choose “Find Full Text –Find Full Text”. Read and accept the copyright warning statement. NOTE: This method of importing PDFs into your EndNote library only works if a)Penn State subscribes to the journal and b) the metadata on the PDF is of good quality. If you do not find a PDF using this method, check to see if Penn State Hershey subscribes to the journal by searching our Journals List . If the article is available, download the PDF to your desktop, rightclick on the corresponding reference in your library, select "File Attachments" then "Attach File" and upload your saved PDF.